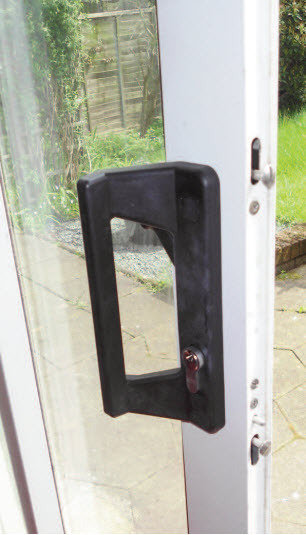 Replacement of a Schlegel BHD 2 Point Euro Patio Lock in an aluminium patio door, writes Dave Fletcher. Local estate agent needed me to look at an aluminium sliding patio door that was locked shut. The house was empty but sold and the new family were due to move in within the next few days. Go to look at the door, not in fantastic condition and looked by the moss build up that it hadn’t been opened in several years. Decided that the likely culprit was a Schlegel and with my best estimation of the backset, there are 5 listed on Aldridge’s. I went off to Northwest Hardware in Warrington to get a new mechanism. 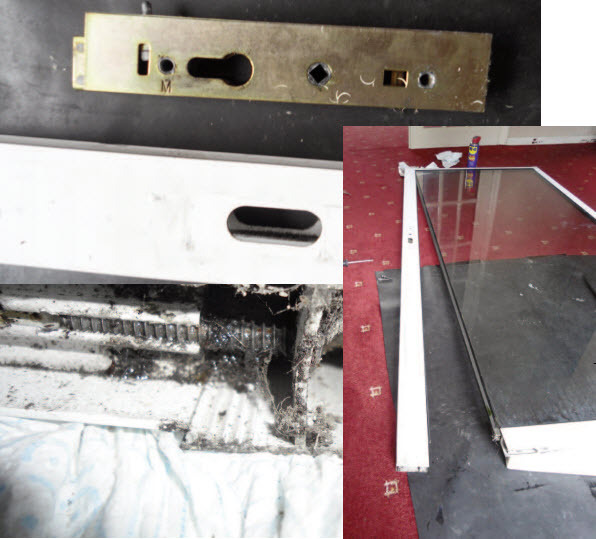 The job started well, handles off, cylinder out quick manipulation and door opened. That’s where it stopped. There’s no opening for the mechanism to slide out of so it’s a door off and frame dismantle to gain access to the mechanism. Being on my own I was a little bit cautious about lifting a door off the runners but thankfully as the house was empty I could at least put it down in the dining room which was still carpeted. So off it came and carefully lowered on to the floor. I have replaced patio rollers before so knew how the frame was screwed together but the screws are sometimes badly corroded so I am careful when unscrewing them out giving them a little lubrication to help things along. Once the top and bottom screws are out the stile can be encouraged to come away from the glass until the back of the stile and the mechanism can be seen. Unscrewing the face plate allows for the removal of the mechanism and its replacement. Fortunately on this occasion I was right on the button with the backset, more luck than judgement with a door shut and the replacement is a straight forward reversal of the removal. A bit of spray silicon on the sealing rubbers and a soft hammer to get the stile back in position, put the screws back and the job’s nearly done. Whilst the door was down I did check the rollers giving them a clean and lubricating the adjusting screws. On this occasion they were fine. I suspect that the door hadn’t been opened due to the failed mechanism for quite a few years so saving wear and tear. Before lifting the door back on to the track I cleaned it off using some brake cleaner, great stuff to clean oils and greases off without leaving any residue. Never oil the track or rollers as they need friction to turn, if they don’t turn they slide and will wear a flat on the wheel which will never turn again but will wear the track in record time. Door lifted back on, adjustment to the wheels to level the door and the lock worked first time. I was the fourth locksmith the estate agent had tried for this work, the others recommended a new door without even looking. So if you’re offered this type of work it’s worth giving it a look they are not always that hard to do.